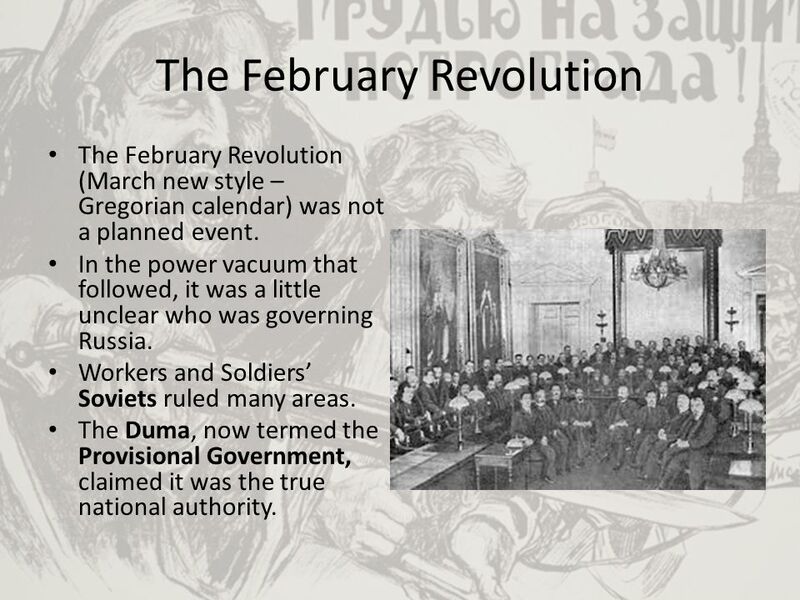 The February Revolution (March new style – Gregorian calendar) was not a planned event. In the power vacuum that followed, it was a little unclear who was governing Russia. Workers and Soldiers’ Soviets ruled many areas. The Duma, now termed the Provisional Government, claimed it was the true national authority. First headed by Prince Lvov, the Provisional Government lacked governing experience. It also faced insurmountable problems: Food shortages worsened. Industrial output dropped. Militants called for radical reforms. The war continued. 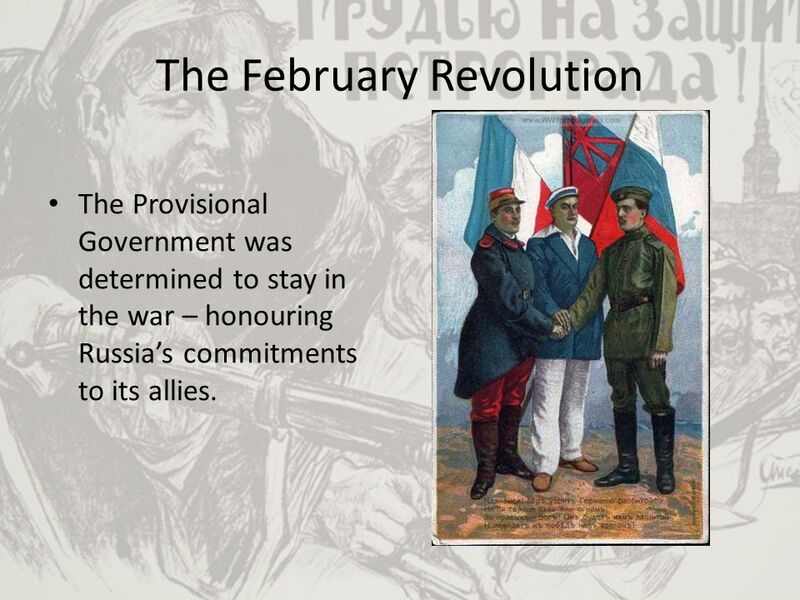 The Provisional Government was determined to stay in the war – honouring Russia’s commitments to its allies. Order #1 of the Petrograd Soviet – which also claimed authority -significantly undermined Russia’s war effort. 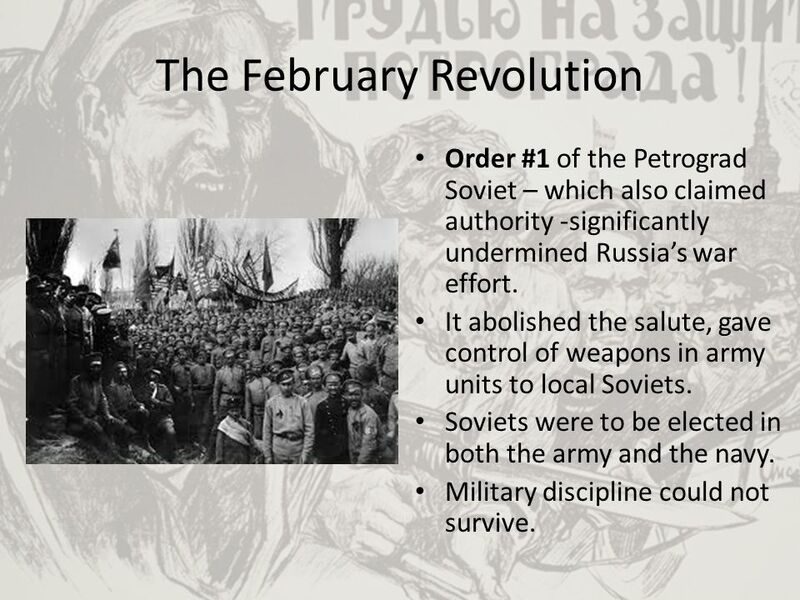 It abolished the salute, gave control of weapons in army units to local Soviets. Soviets were to be elected in both the army and the navy. Military discipline could not survive. The War Minister, Alexander Kerensky, who later came to head the government, ordered a general offensive in June. 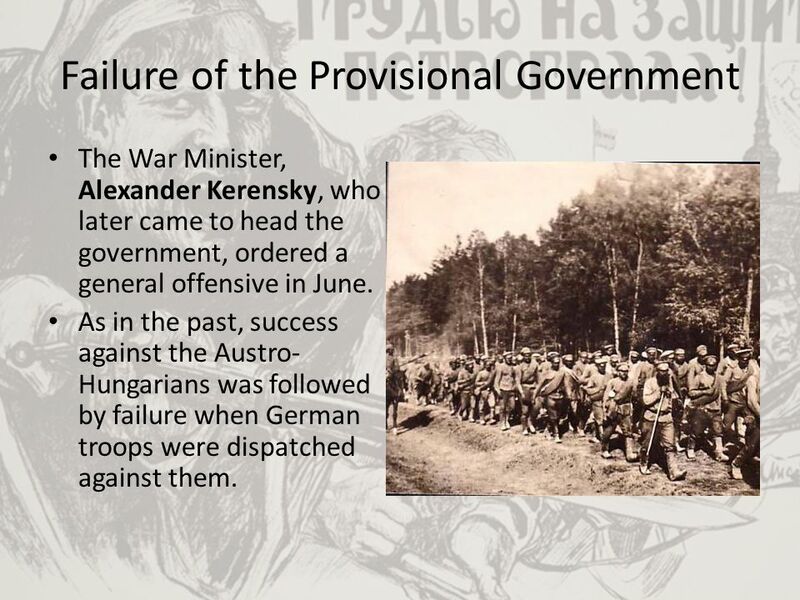 As in the past, success against the Austro-Hungarians was followed by failure when German troops were dispatched against them. The failed offensive broke the Russian army. Soldiers mutinied, sometimes killing their officers. Others simply walked away from the front. Blocking battalions could no longer stop them. The end of the Tsar brought a return of exiles. Lenin returned from Zurich. 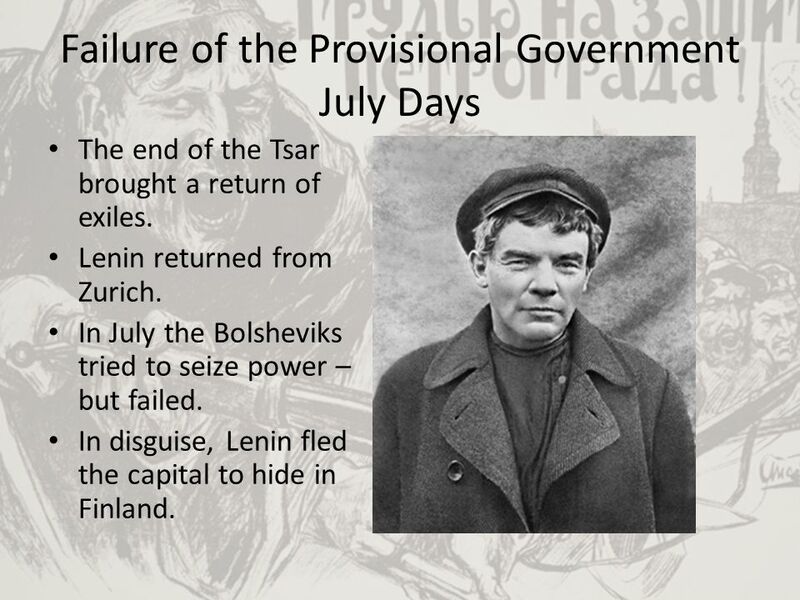 In July the Bolsheviks tried to seize power – but failed. In disguise, Lenin fled the capital to hide in Finland. 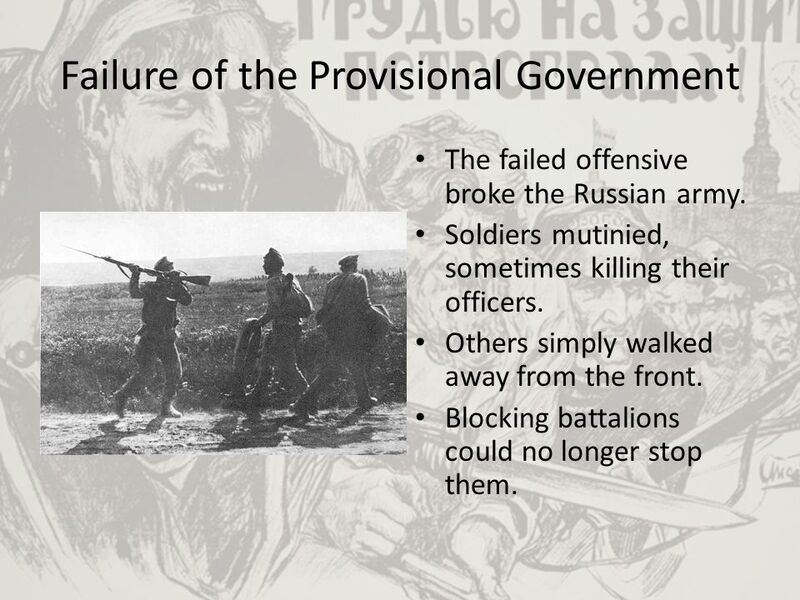 Next a general tried to depose the Provisional Government. General Kornilov marched on the capital from the Northern Front. 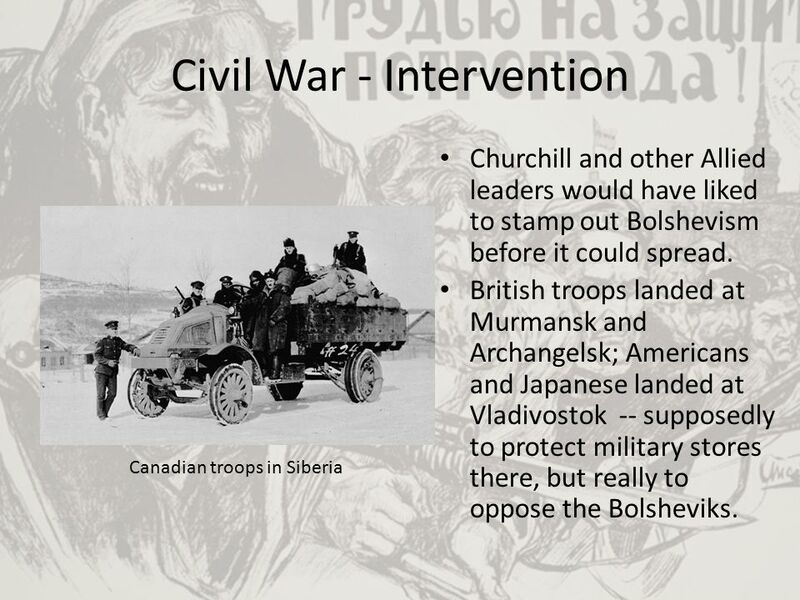 In desperation, the government even called on the Bolsheviks to help them defend the capital. 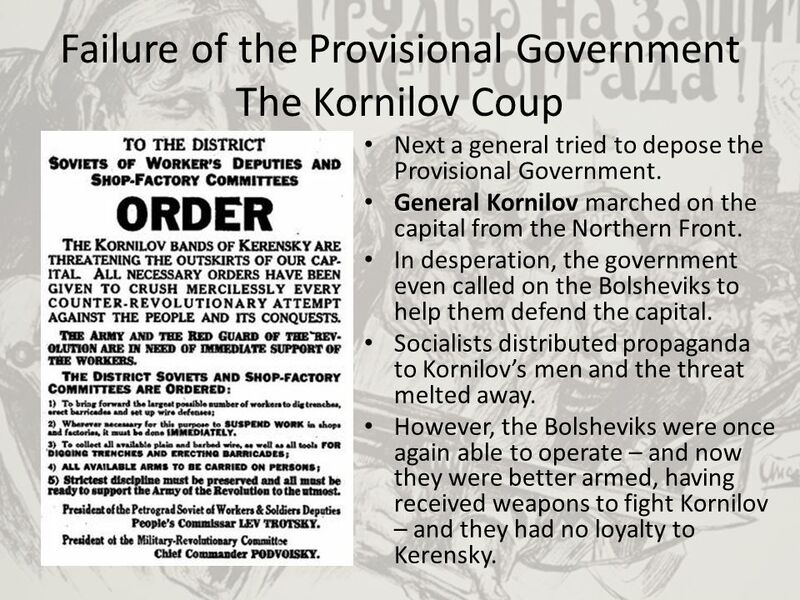 Socialists distributed propaganda to Kornilov’s men and the threat melted away. However, the Bolsheviks were once again able to operate – and now they were better armed, having received weapons to fight Kornilov – and they had no loyalty to Kerensky. 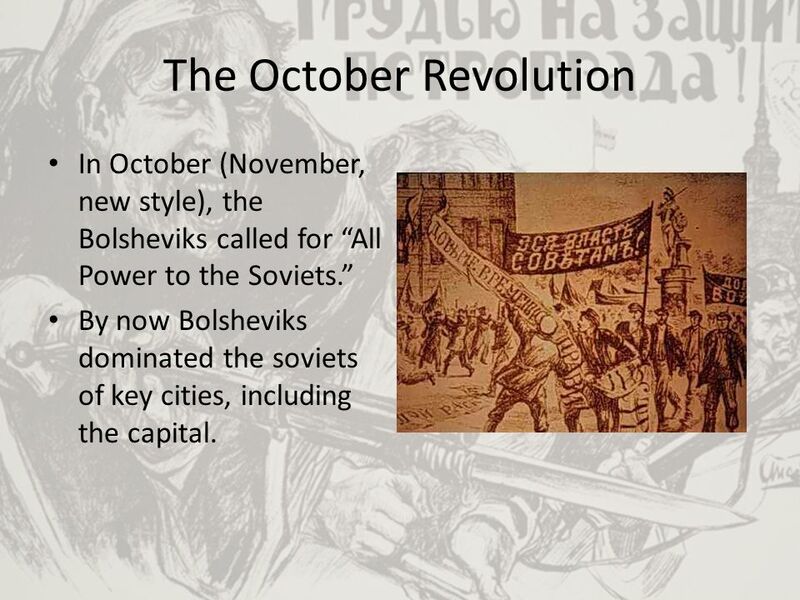 In October (November, new style), the Bolsheviks called for “All Power to the Soviets.” By now Bolsheviks dominated the soviets of key cities, including the capital. 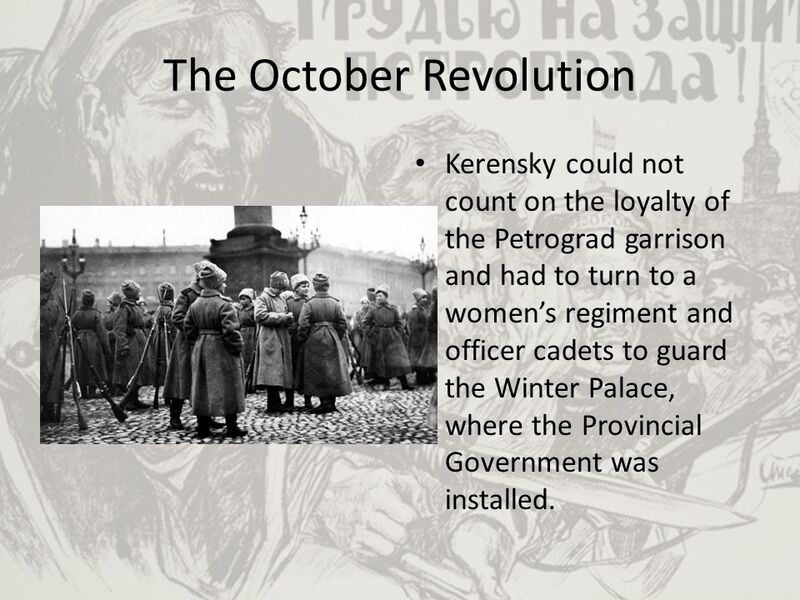 Kerensky could not count on the loyalty of the Petrograd garrison and had to turn to a women’s regiment and officer cadets to guard the Winter Palace, where the Provincial Government was installed. 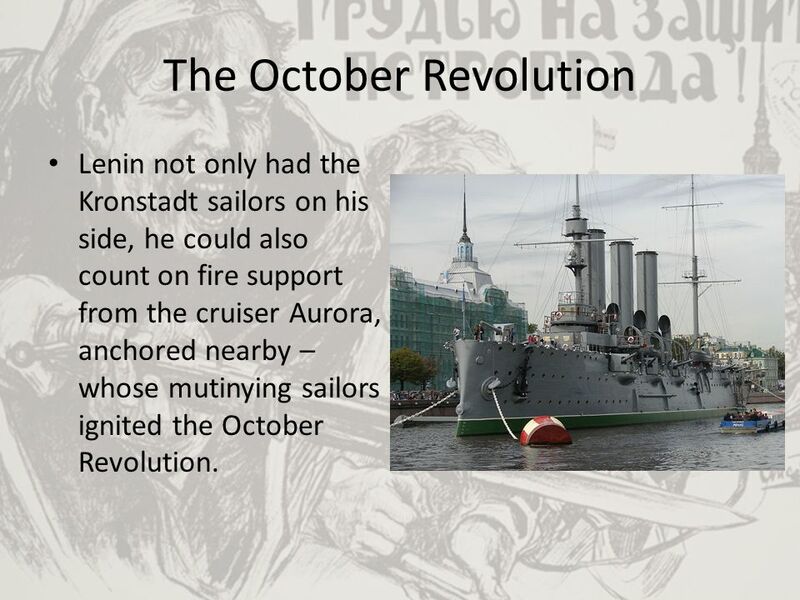 Lenin not only had the Kronstadt sailors on his side, he could also count on fire support from the cruiser Aurora, anchored nearby – whose mutinying sailors ignited the October Revolution. In the capital, the revolution was less dramatic than might be expected. Resistance was quickly overcome. Kerensky and others fled. More damage was done to the Winter Palace in the making of a 1925 film of the event (where live ammunition was used) than in the revolution itself. Moderates and other socialists stood on the sideline. They lacked strong leadership. Only the Bolsheviks were clear in their goals and tactics – allowing them to take the key national centers of Petrograd and Moscow. The non-Bolshevik Left and moderates negotiated while Lenin consolidated power. 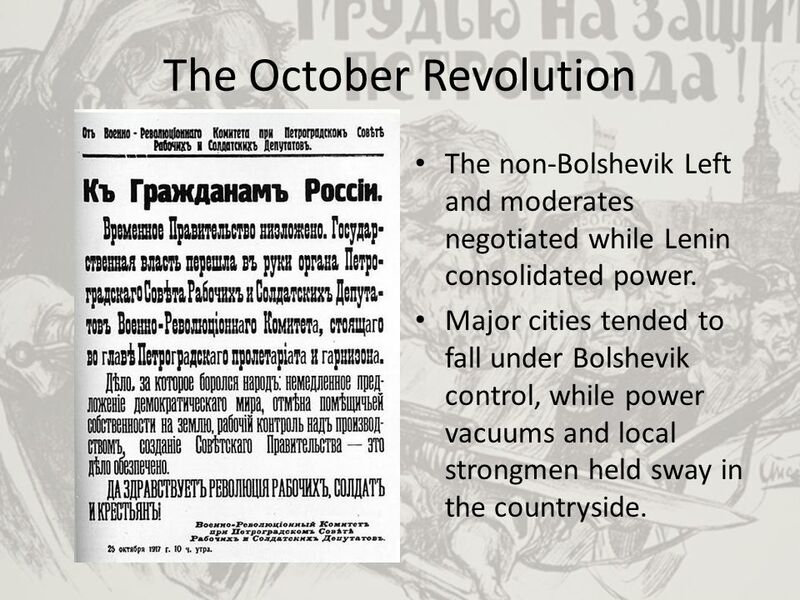 Major cities tended to fall under Bolshevik control, while power vacuums and local strongmen held sway in the countryside. The Bolseviks ruled indirectly through the All Russian Congress of Soviets. They quickly passed three decrees: The Peace Decree, declaring the war over. The Land Decree, handing land over to the peasants. The Self-Determination Decree, allowing all ethnic groups independence if they wished it. 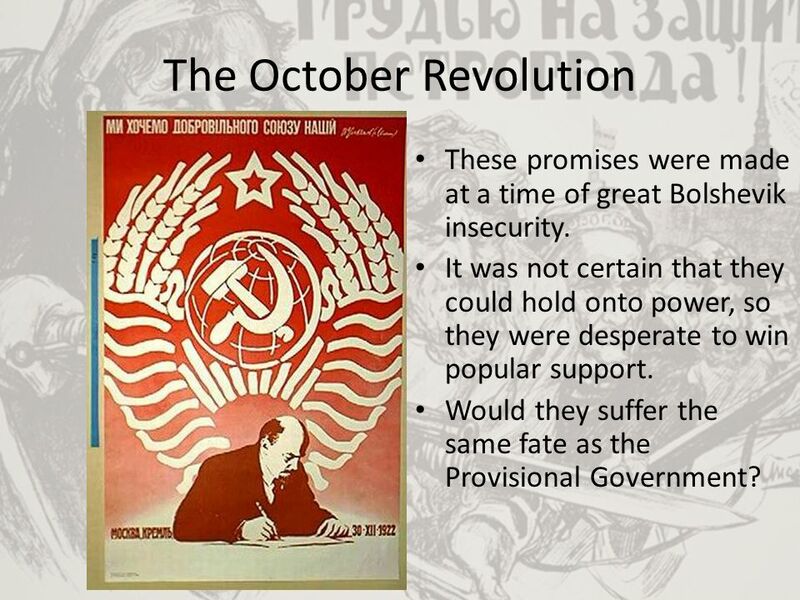 These promises were made at a time of great Bolshevik insecurity. It was not certain that they could hold onto power, so they were desperate to win popular support. Would they suffer the same fate as the Provisional Government? 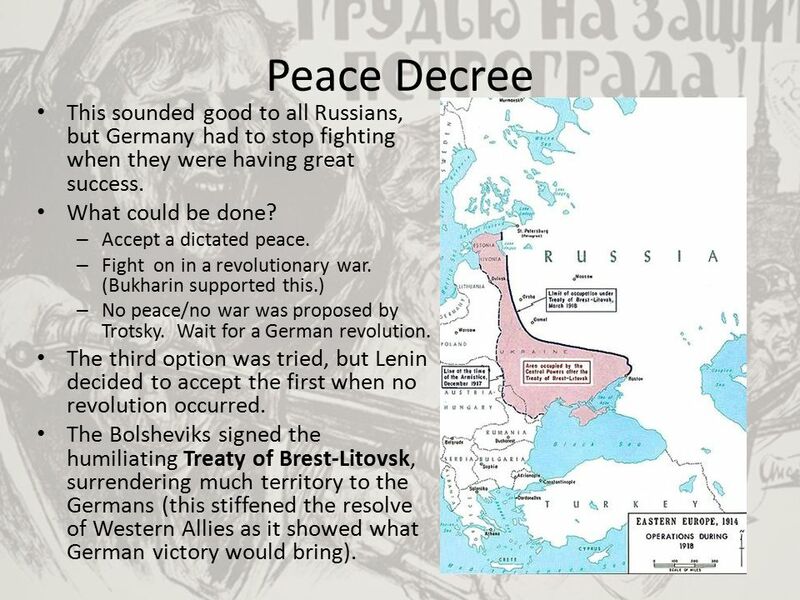 18 Peace Decree This sounded good to all Russians, but Germany had to stop fighting when they were having great success. What could be done? Accept a dictated peace. Fight on in a revolutionary war. (Bukharin supported this.) No peace/no war was proposed by Trotsky. Wait for a German revolution. The third option was tried, but Lenin decided to accept the first when no revolution occurred. The Bolsheviks signed the humiliating Treaty of Brest-Litovsk, surrendering much territory to the Germans (this stiffened the resolve of Western Allies as it showed what German victory would bring). 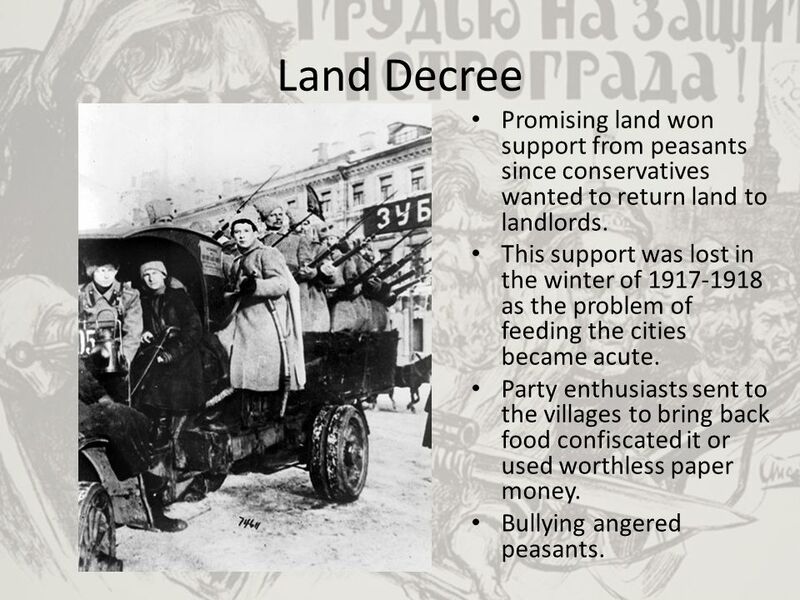 19 Land Decree Promising land won support from peasants since conservatives wanted to return land to landlords. This support was lost in the winter of as the problem of feeding the cities became acute. Party enthusiasts sent to the villages to bring back food confiscated it or used worthless paper money. Bullying angered peasants. 20 Famine The 1919-20 famine hit hard. Cities were affected 1st. Party Members got rations, other starved. People bartered possessions for food. People abandoned cities: Moscow lost ½ its population. Petrograd lost 2/3. 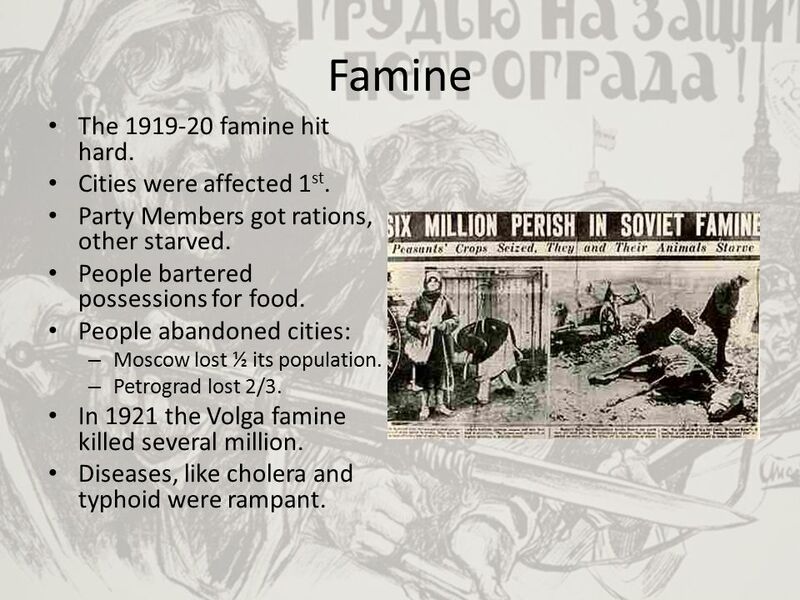 In 1921 the Volga famine killed several million. Diseases, like cholera and typhoid were rampant. 21 Industry Industrial production collapsed. Coal fell to 25% 1913 levels. Cast iron to 3% Copper production ceased. There were severe shortages of materials and spare parts. Railway rolling stock was only ½ of what was available in 1917. 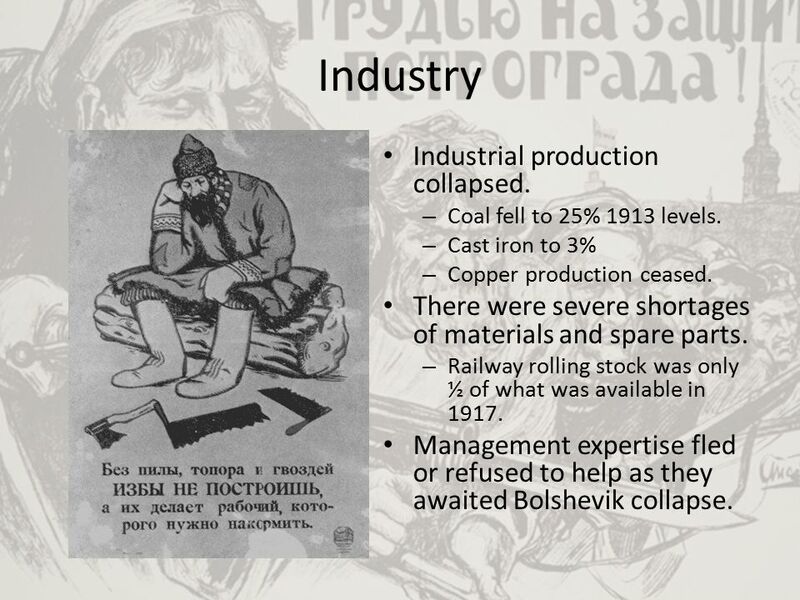 Management expertise fled or refused to help as they awaited Bolshevik collapse. 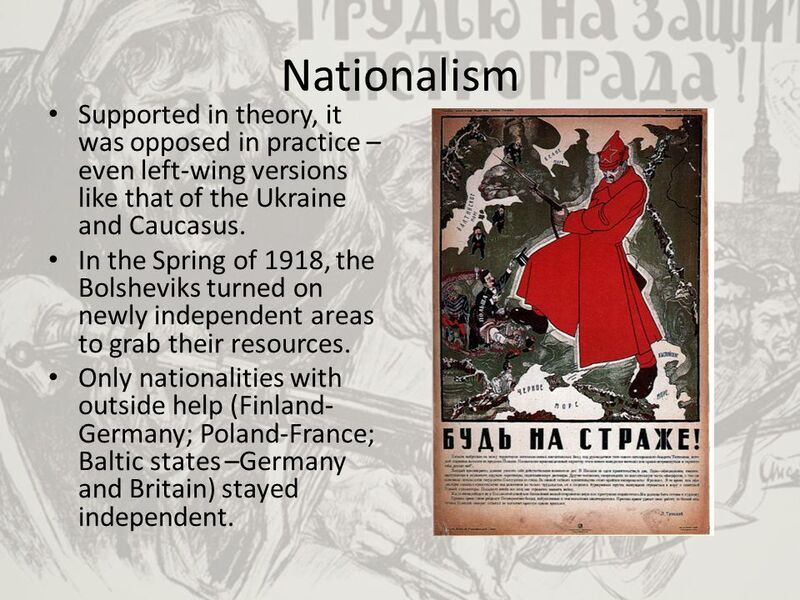 22 Nationalism Supported in theory, it was opposed in practice – even left-wing versions like that of the Ukraine and Caucasus. In the Spring of 1918, the Bolsheviks turned on newly independent areas to grab their resources. Only nationalities with outside help (Finland-Germany; Poland-France; Baltic states –Germany and Britain) stayed independent. 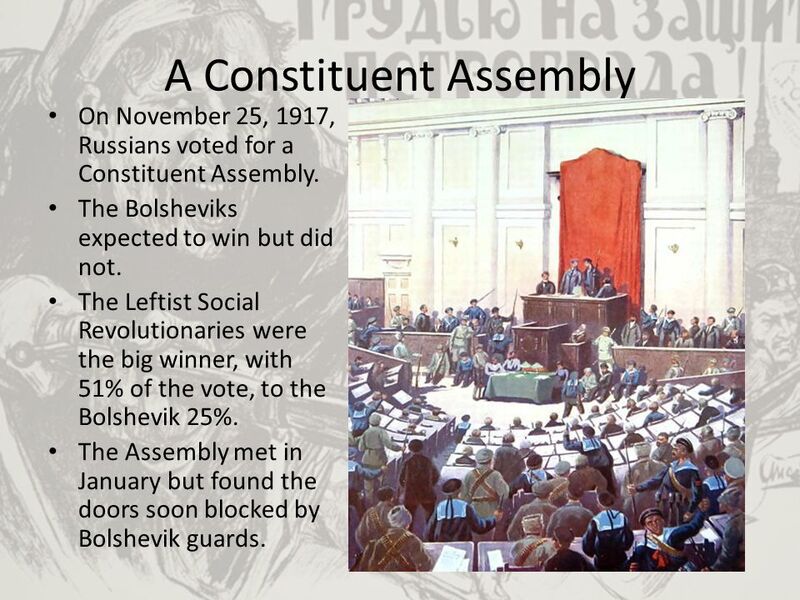 On November 25, 1917, Russians voted for a Constituent Assembly. The Bolsheviks expected to win but did not. The Leftist Social Revolutionaries were the big winner, with 51% of the vote, to the Bolshevik 25%. 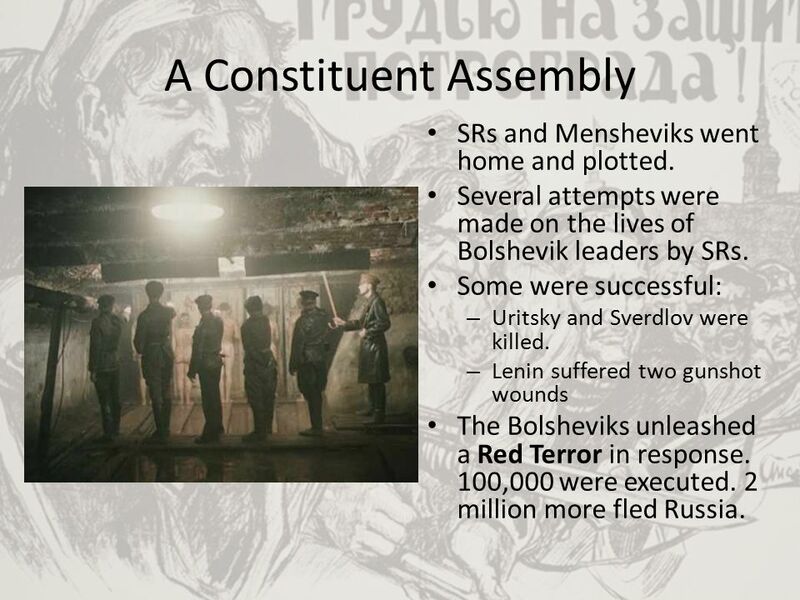 The Assembly met in January but found the doors soon blocked by Bolshevik guards. SRs and Mensheviks went home and plotted. 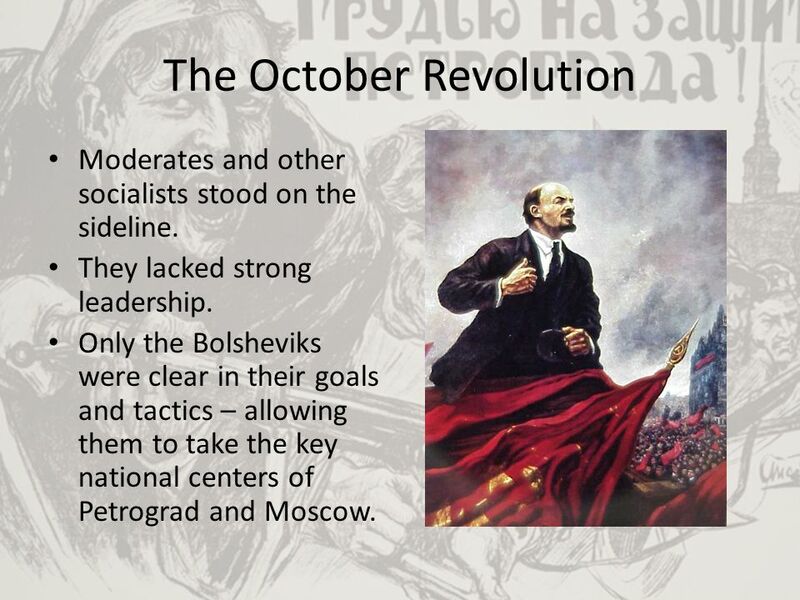 Several attempts were made on the lives of Bolshevik leaders by SRs. Some were successful: Uritsky and Sverdlov were killed. Lenin suffered two gunshot wounds The Bolsheviks unleashed a Red Terror in response. 100,000 were executed. 2 million more fled Russia. 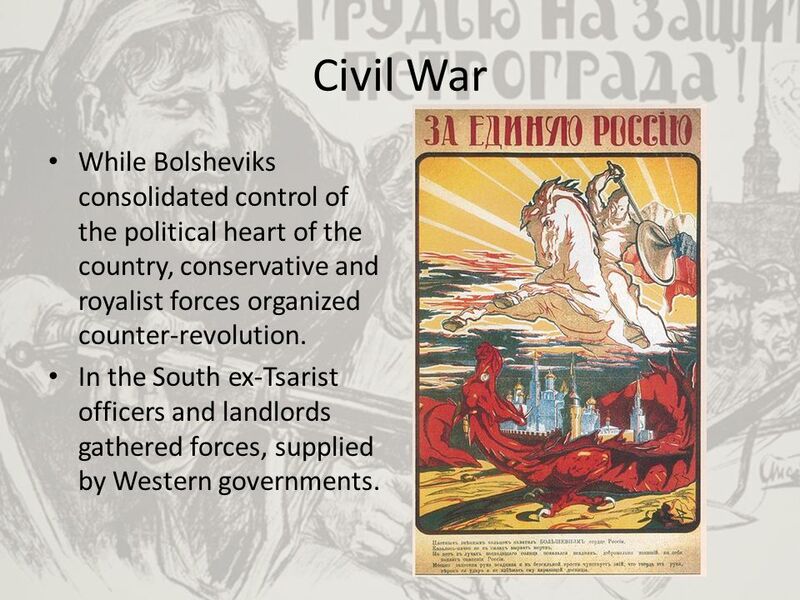 25 Civil War While Bolsheviks consolidated control of the political heart of the country, conservative and royalist forces organized counter-revolution. 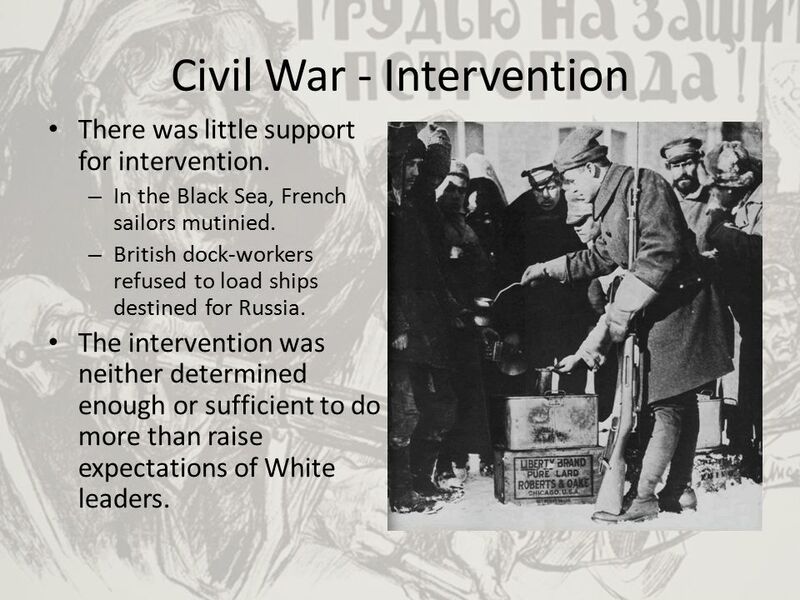 In the South ex-Tsarist officers and landlords gathered forces, supplied by Western governments. There was little support for intervention. In the Black Sea, French sailors mutinied. British dock-workers refused to load ships destined for Russia. The intervention was neither determined enough or sufficient to do more than raise expectations of White leaders. 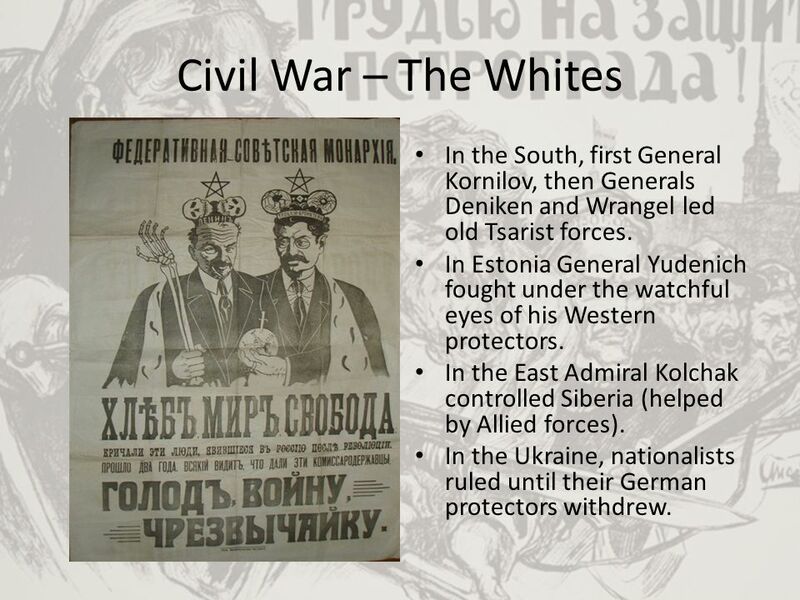 28 Civil War – The Whites In the South, first General Kornilov, then Generals Deniken and Wrangel led old Tsarist forces. In Estonia General Yudenich fought under the watchful eyes of his Western protectors. In the East Admiral Kolchak controlled Siberia (helped by Allied forces). In the Ukraine, nationalists ruled until their German protectors withdrew. The oddest anti-Red force consisted of Czechoslovak soldiers who fought on the Allied side against Austria-Hungary. They sought to leave Russia via the Trans Siberian Railway, to continue the war. En-route a brawl between them and Hungarian prisoners occurred at Chelyabinsk. 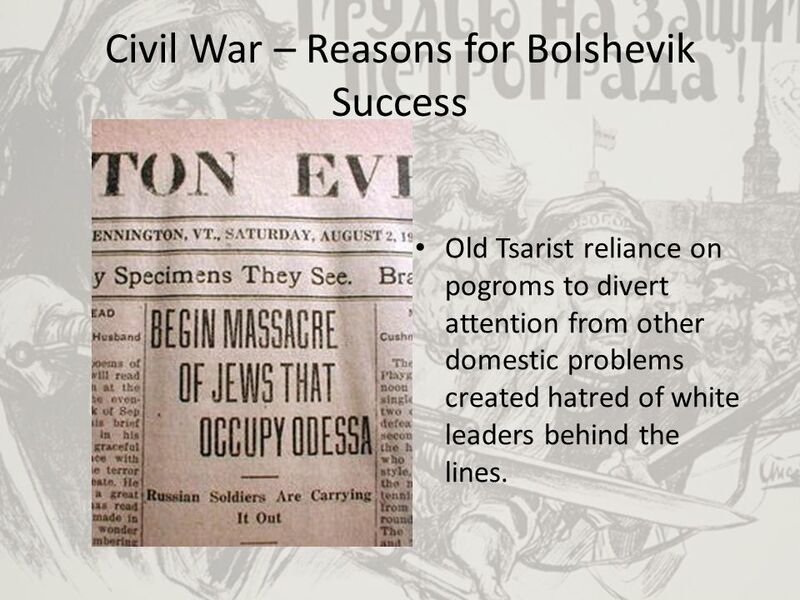 Heated emotions led to conflict with local Bolshevik authorities. 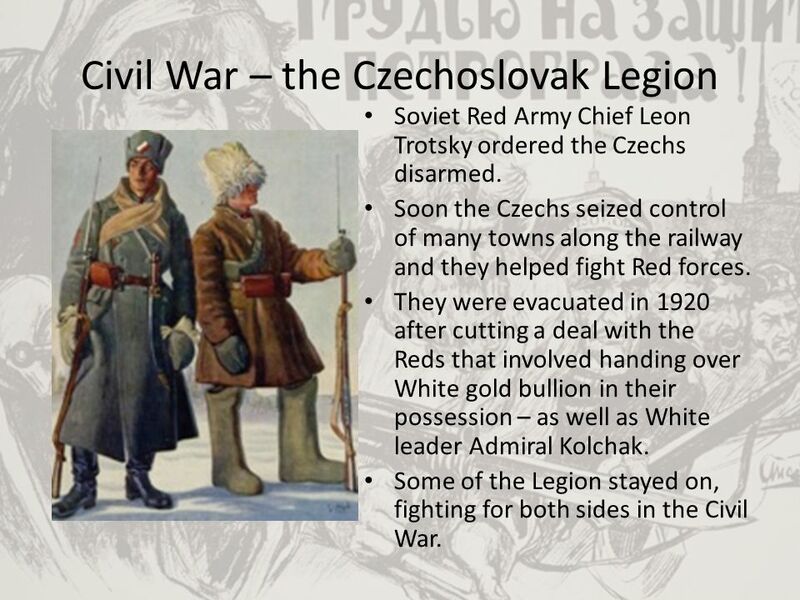 Soviet Red Army Chief Leon Trotsky ordered the Czechs disarmed. 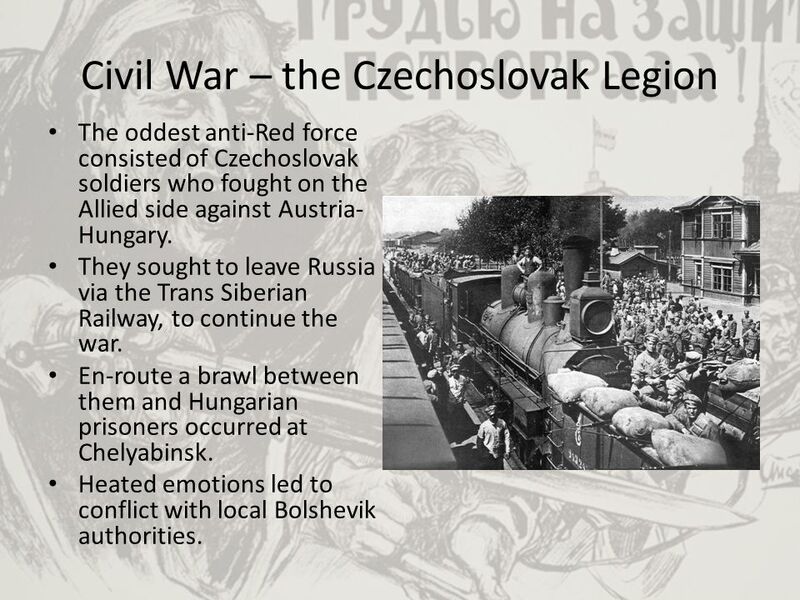 Soon the Czechs seized control of many towns along the railway and they helped fight Red forces. They were evacuated in 1920 after cutting a deal with the Reds that involved handing over White gold bullion in their possession – as well as White leader Admiral Kolchak. Some of the Legion stayed on, fighting for both sides in the Civil War. 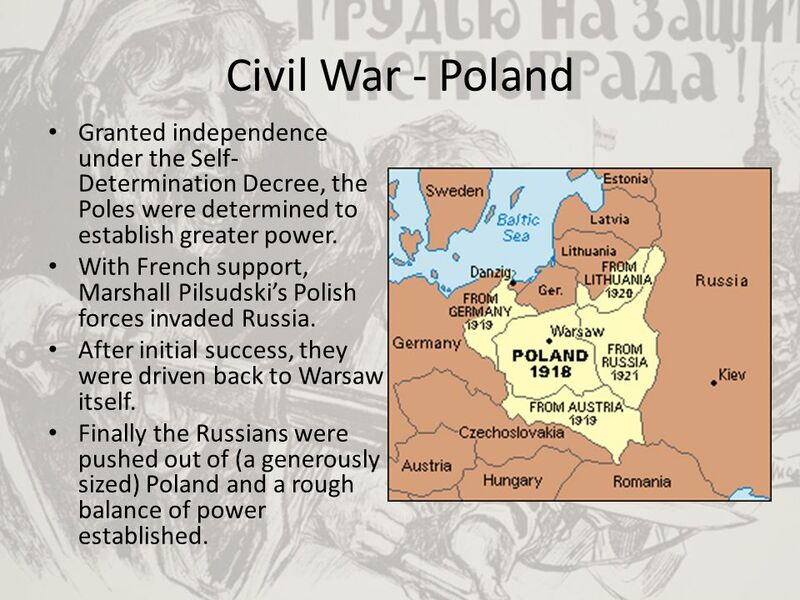 31 Civil War - Poland Granted independence under the Self-Determination Decree, the Poles were determined to establish greater power. With French support, Marshall Pilsudski’s Polish forces invaded Russia. After initial success, they were driven back to Warsaw itself. Finally the Russians were pushed out of (a generously sized) Poland and a rough balance of power established. 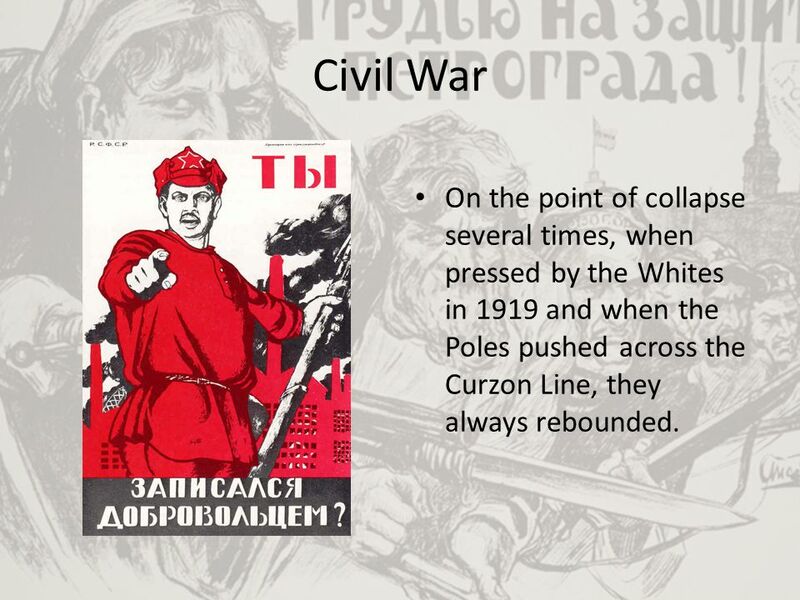 32 Civil War On the point of collapse several times, when pressed by the Whites in 1919 and when the Poles pushed across the Curzon Line, they always rebounded. Control of the central region, including crucial communications centers – Petrograd and Moscow. Troops could be transferred relatively quickly from one front to another. 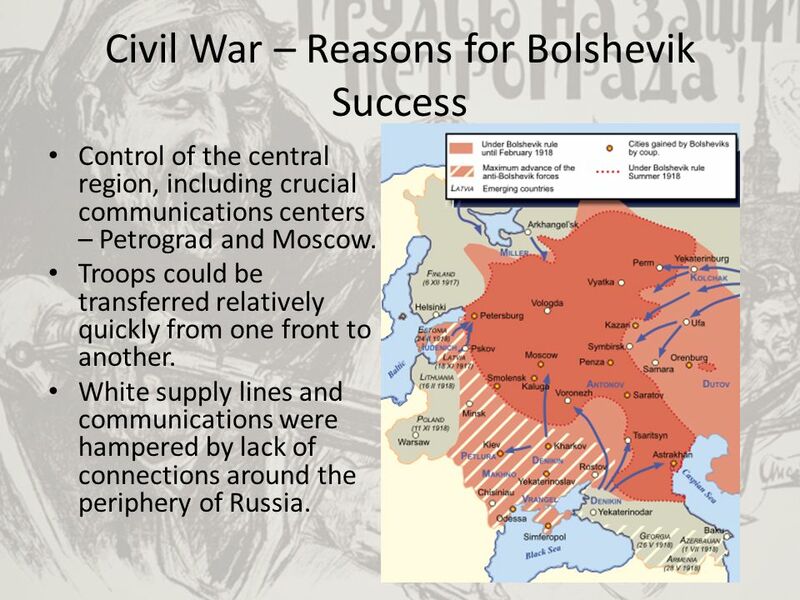 White supply lines and communications were hampered by lack of connections around the periphery of Russia. 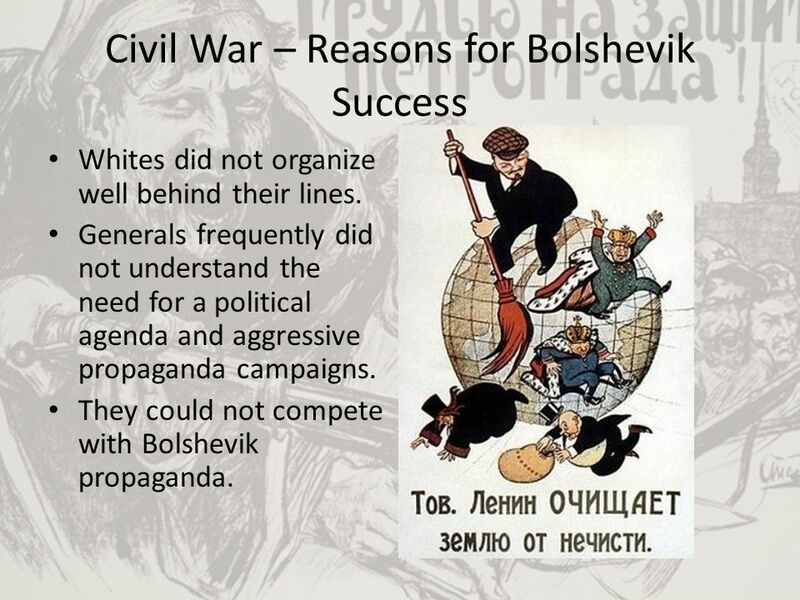 White armies lacked political appeal. Their goals varied from restoration of the unpopular monarchy to establishing a liberal regime. They were united only in their opposition to Bolshevism. Whites did not organize well behind their lines. Generals frequently did not understand the need for a political agenda and aggressive propaganda campaigns. They could not compete with Bolshevik propaganda. Old Tsarist reliance on pogroms to divert attention from other domestic problems created hatred of white leaders behind the lines. 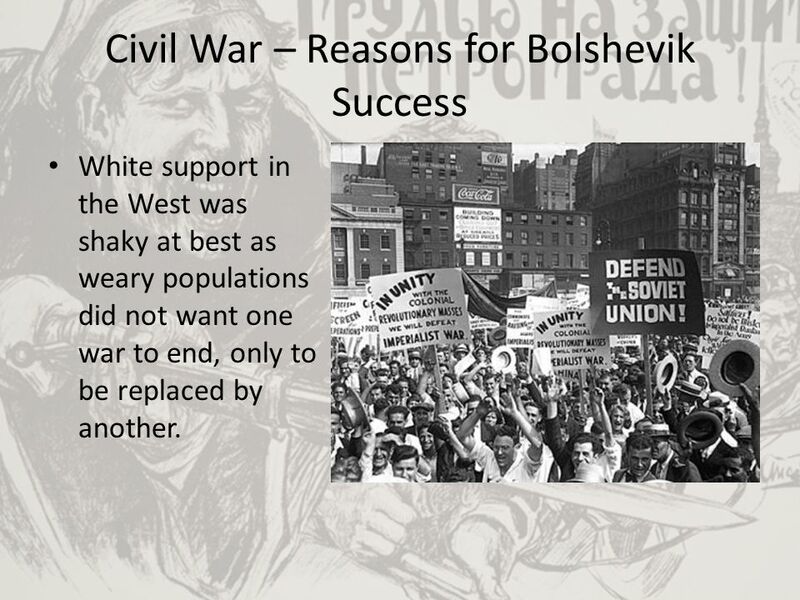 White support in the West was shaky at best as weary populations did not want one war to end, only to be replaced by another. The Red Army, though not particularly efficient, was huge. By 1920 it was the largest army in the world at 5.5 million men. 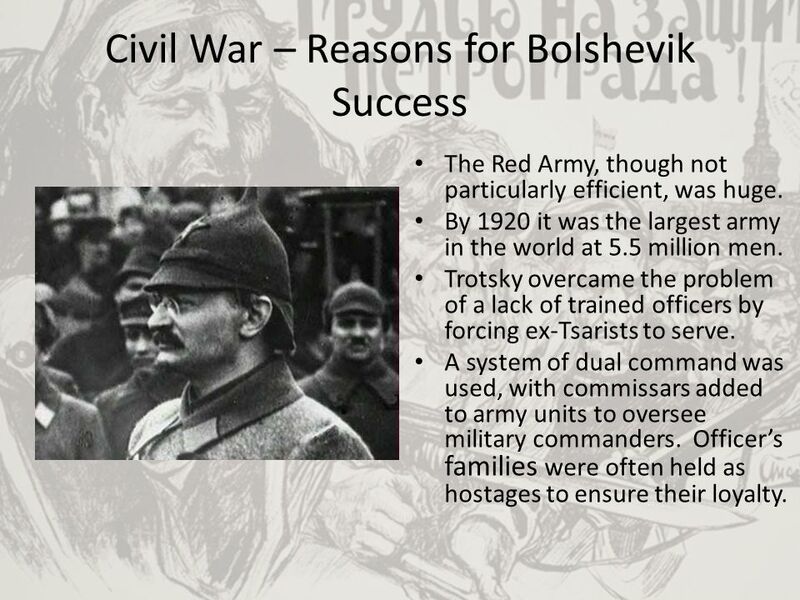 Trotsky overcame the problem of a lack of trained officers by forcing ex-Tsarists to serve. A system of dual command was used, with commissars added to army units to oversee military commanders. Officer’s families were often held as hostages to ensure their loyalty. 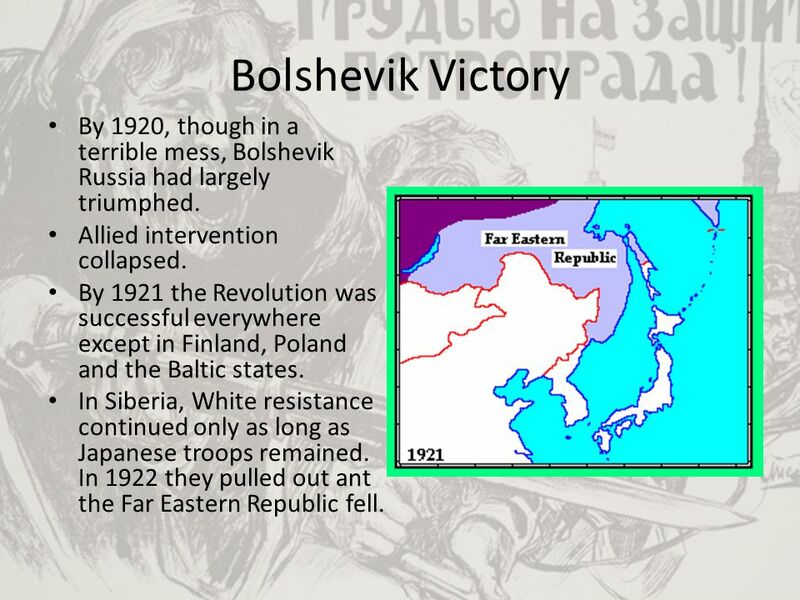 39 Bolshevik Victory By 1920, though in a terrible mess, Bolshevik Russia had largely triumphed. Allied intervention collapsed. By 1921 the Revolution was successful everywhere except in Finland, Poland and the Baltic states. In Siberia, White resistance continued only as long as Japanese troops remained. In 1922 they pulled out ant the Far Eastern Republic fell. 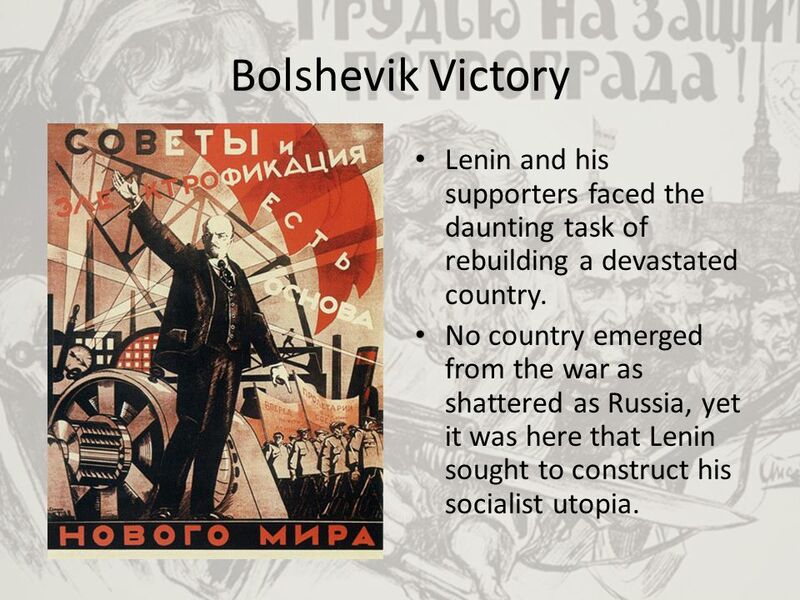 40 Bolshevik Victory Lenin and his supporters faced the daunting task of rebuilding a devastated country. No country emerged from the war as shattered as Russia, yet it was here that Lenin sought to construct his socialist utopia. 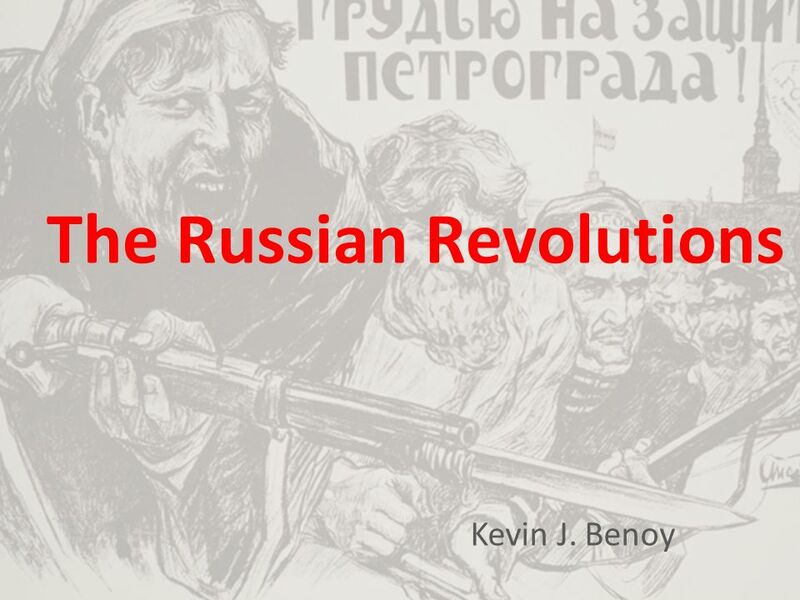 Download ppt "The Russian Revolutions"
ISSUE 4 INTERNAL AND EXTERNAL THREATS TO THE REVOLUTION AND HOW THEY WERE DEALT WITH. The Turning Point The United States Enters, Russia Exits. 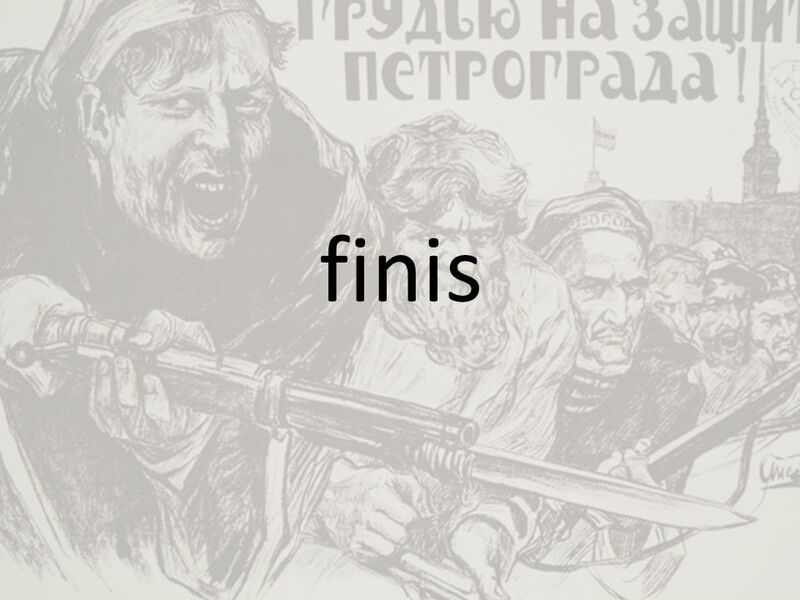 Russian Revolution Semester 2 – Day 146. Bellwork: Honors. Unprepared for a World War -The Russian Empire was far less industrialized than western Europe, the U.S., and Japan. -Because of Russia’s size and agrarian. © Boardworks Ltd of 19 © Boardworks Ltd of 19 These icons indicate that teacher’s notes or useful web addresses are available in the Notes. 1894 Czar Nicholas II becomes the ruler of Russia. He believes that the absolute power of the czars should be preserved. 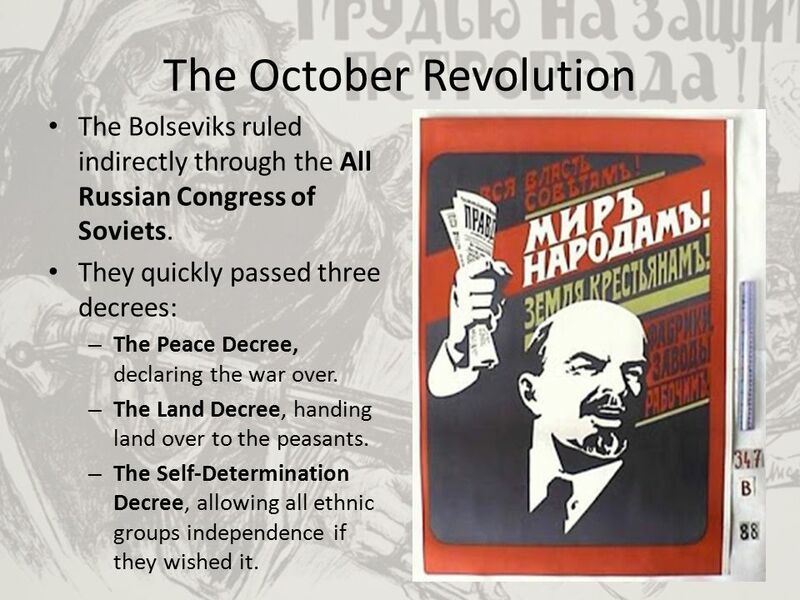 Year 12 History NCEA 2.5 Force or Movement The Russian Revolution. Revolution & Civil War in Russia. 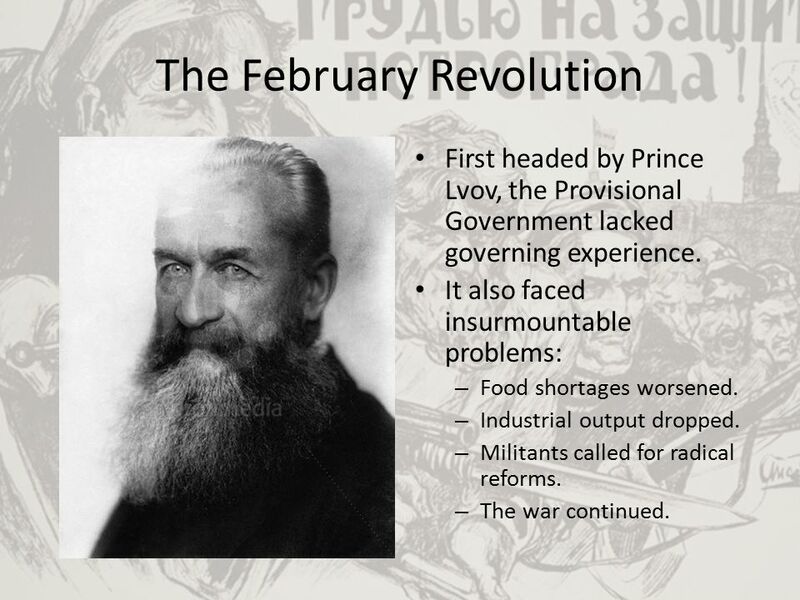 I.The March Revolution brings an end to Tsarism 1917 In 1914, Russia was slow to industrialize. The Tsar and nobles. LENIN GENERAL KOLCHAK REDS WHITES Aims10 Total Bolshevik control of all Russian territory Leadership10 Confident and disciplined. With Trotsky they devised. Russian Revolution Text pages SSWH17 The student will be able to identify the major political and economic factors that shaped world societies. The Russian Revolution Causes of the Russian Revolution. 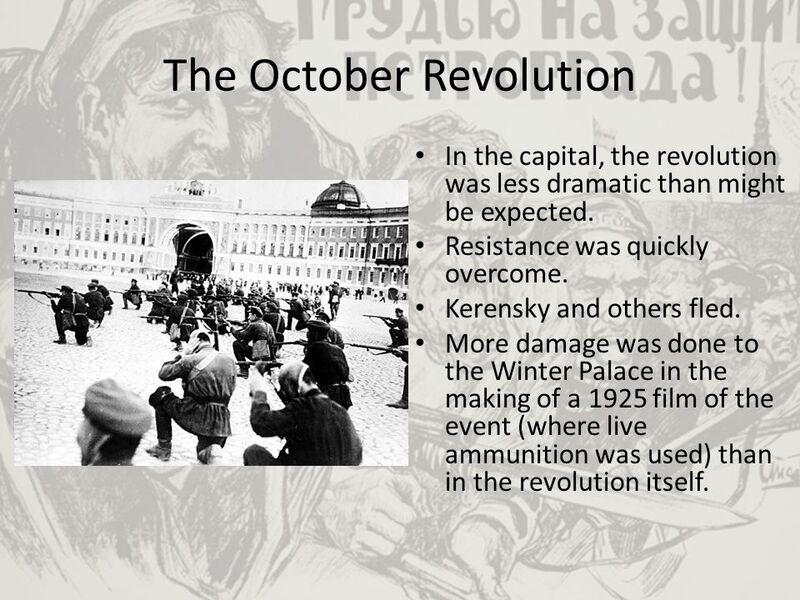 After July days – it dropped dramatically By Oct 1917 – situation had transformed After Kornilov affair – Bolsheviks were not seen as the biggest threat. The Bolshevik Takeover In November of 1917, squads of guards consisting of armed factory workers and sailors from a Russian fleet. These Lenin forces. The Russian Revolution  Czar Nicholas II  Wife Alexandra  Son Alexis- suffered from hemophilia  Daughters Tatiana, Olga, Maria, and Anastasia. 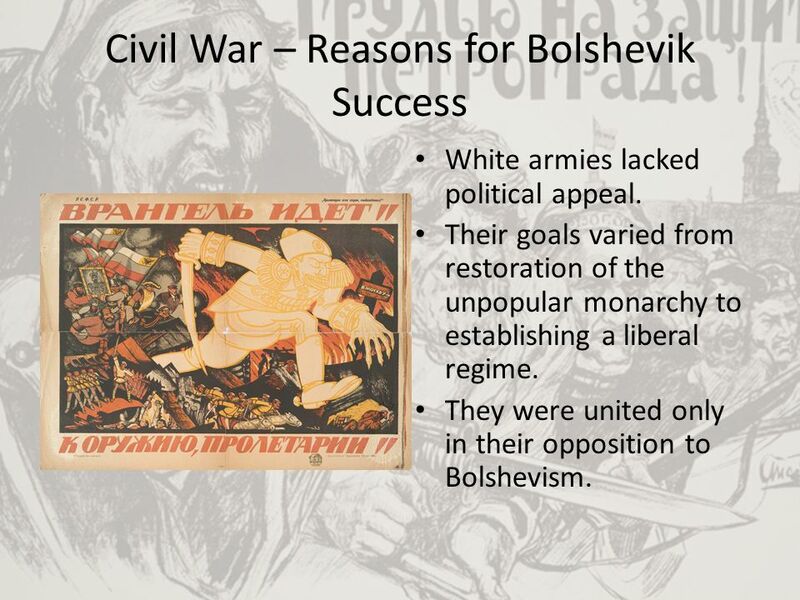 The Early Years of the Bolshevik Government The Civil War.